Optimus Maximus Configurator allows you to switch between different layouts depending on the current OS language or active application. 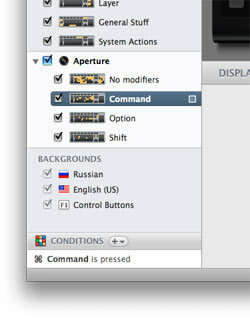 You can customize layout either through the Settings menu or using an external graphic editor. Interface is based on layers used to create custom keyboard layouts. Download and install Optimus Maximus Configurator. Plug in your Optimus Maximus keyboard and connect it to your computer. Tray icon color changes the moment Configurator detects Optimus Maximus keyboard. Download and launch Optimus Maximus Configurator. Double click .layers file or drag and drop it onto the Optimus Maximus Configurator application. You may also click the Import button on the toolbar and locate .layers file. Any trouble? Feel free to e-mail us at support@artlebedev.com. Please do not forget to specify the version of your operating system.